The Spectacular Now by Tim Tharp, read by MacLeod Andrews. Grades 9+ Knopf Books for Young Readers, 2008. Brilliance Audio 2009. 8 hours and 13 minutes. Sutter Keely's got a big heart and big cup of 7-Up and whiskey. He prides himself on having a spectacular time always and he's not so much about planning for the future or concentrating on negative things like his beautiful fat girlfriend Cassidy breaking up with him or the fact that his dad's not really around too much. On the night he drives his car into a front lawn, he meets Aimee, a hopelessly nerdy girl whom Sutter knows he can help. But is it possible that Sutter might need Aimee's help, too? I picked up this audiobook after hearing MacLeod Andrews* at the ALA Odyssey Awards reception this summer and I was immediately sucked in by the humor and Andrews's believable Oklahoma drawl. This is a story that lends itself very well to the audio format and with Andrews at the helm, it's just like Sutter Keely himself is sitting across from you and telling you the story. What's interesting is that Sutter's a little bit of an unreliable narrator. Sure, everything's fine and dandy, spectacular, even. But we know that a high school senior who steals alcohol from the grocery store, keeps a steady buzz going throughout the day, and gets blackout drunk every weekend is not fine and dandy. Sutter needs help and he doesn't even realize it. Enter Aimee. Because as much as Sutter wants to help Aimee (even if things sometimes go awry), he needs Aimee's help, too. And it's going to take a girl like Aimee, a girl who's not like other girls, to get Sutter to start to see things the way they are. Don't get me wrong. Aimee's NOT a manic pixie dreamgirl. She's kind of the opposite, in fact. She's socially awkward. She's bossed around by her best friend. She loves science fiction novels (and I mean truly nerdy science fiction novels), wears t-shirts with horses painted on them, and dreams about working for NASA. Just the same, I think this is a story that'll appeal to the Nerdfighting crowd and I'd recommend it to fans of John Green's Paper Towns. The Spectacular Now, 2008 National Book Award Honoree, is funny and serious at the same time. Sutter's heavy alcohol use is a great starting point for discussion. I think audio's the way to go for this one, folks. MacLeod Andrews does a fantastic job narrating. He's got a nice Oklahoma drawl for Sutter and he voices the characters just enough that they're distinguishable without going over the top. Andrews simply becomes Sutter Keely and that lets the listener really sink into the audiobook and become immersed in the story. This audiobook had me looking forward to my commute and road trips so I could continue the story. 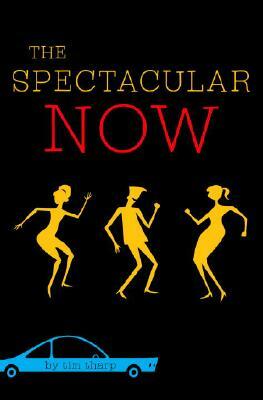 The Spectacular Now is available, well, now. * Who, I have recently learned, hails from my own hometown of Louisville, KY! Also, whose name is pronounced "McLoud". Hey, I'm an Audible affiliate, so if you purchase stuff after clicking on the links here I may receive a small commission.